This beautiful lampshade collapses down to almost flat thanks to the way it was made: with lasers. If only everything was made with lasers. The only way to create something with this sort of complexity is rapid prototyping—and laser sintering, to be exact. The process works by sweeping a laser across a pan of powdered nylon; when the lasers hit the nylon, it fuses ("sinters"). The process repeats in layers, until the final product emerges. Thus, you can create interlocking shapes all at once—for example, a chain whose links are completely closed. 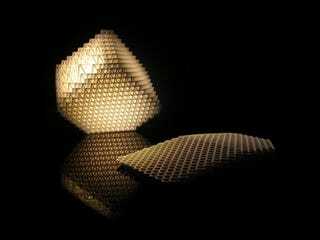 Dror created the lamp for Materialise.MGX, which specialises in producing furniture using laser sintering. The lamp shade itself is designed so that the cubes are densest in the center—thus diffusing the light simply by overlapping.